The video below shows a “slice of life” from La Carpio, with some videos and images from celebrations and everyday life. Some explanation may help, however. The first scenes with the smoldering heap at the base of the stake and the fireworks are from New Years’ Eve celebration. A human-sized dummy is made from pillows and old clothes, stuffed with firecrackers, hung from a pole, and dowsed with gasoline. At midnight, to symbolize the passing of the old year, the dummy is lit on fire, bursting into flame and falling into a heap. Meanwhile, the crowd in the streets is privy to the elaborate fireworks displays from some of the nearby resorts and hotels. My person being the principle “research instrument” of my study, living and gathering data in La Carpio, I had surprisingly few problems with health. I had occasional problems with clogged sinuses, sore throats, and small annoyances of the like. The family mentioned sickness, however, as one of the main reasons for missing school. “Sickness” they described as rashes that would break out on their skin, and in later conversations, as asthma (although they said asthma wasn’t really a reason they missed school). It is difficult for me to gage, as an outsider, what a reasonable level of comfort inside the home was. The conditions were so far below what I was used to that I could highlight any number of health risks inside the home; however, it would be hard to single out any one factor as acutely hazardous. “I’m a popsicle!” Britani shouts cheerfully at me from the doorway to their portion of the home. Britani will turn three in a few weeks. She’s wrapped up in a towel and her hair is still dripping, slicked back as one of her sisters tugs a comb through it aggressively. Her teeth are chattering while she laughs in a high-pitched giggle. “Why are you a popsicle?” I ask. “Because I just took a bath!” she breaks into giggles. “I’m freezing!” Britani hates taking baths unless the water is warmed up for her. Today she has to bathe and get dressed up, though, because she is going to the clinic with her mom. She is full of bubbly giggles and laughter, talking with exaggerated expressions that strike me as unbearably cute, but have no effect on the rest of her family. Before I leave for work, she asks me to take a photo of her all dressed up and ready to go out. She adorns her outfit with a white washcloth tucked into her jeans to add a stylish flourish. The reason she’s a popsicle, of course, is because the water is frigid, poured in bowlfuls from a large, 55-gallon blue plastic drum. The drum resides next to the toilet and is filled every morning by a hose connected to one of the spigots in the front of the home. This huge drum (estañon?) is filled each morning, sometimes more than once a day, and used for bathing and flushing the toilet. No one explained these processes to me, which were different in the home than in other places I’d lived. Flushing the toilet is done by scooping a bowlful of water, holding it high above the toilet, and expertly slinging it into the bowl so the gravity creates pressure in the tube and carries the toilet water underground and into the large cement pipe a few meters away, which dumps it straight into the river a couple dozen meters from the house. The cement pipes were just recently installed – about a year ago, and everyone’s waste water is carried to the river through the pipes. Water used for cooking, cleaning, and bathing passes through the home in an uncovered trench and out into the street, where it joins greywater from other homes in another uncovered dirt trench on its way to the river. However, corrugated steel walls are completely light-proof, and there are no windows in the room. 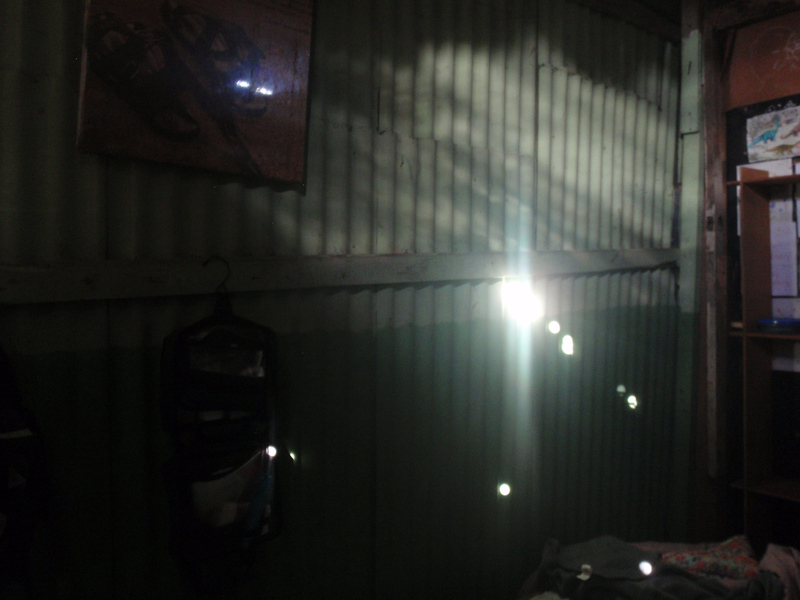 The only light that peeps into my room in the early morning is the bright golden circles of light irregularly pocking the wall furthest from the street. 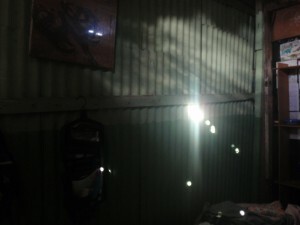 These perfectly circular bubbles of light are created by the morning sunlight piercing through the nailholes in the patchwork of steel sheets making up my wall. 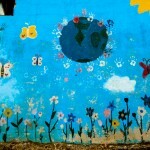 I lay awake in the mornings sometimes, fascinated by the bright spots of light on my wall. Part of my fascination is the thin sliver of light the sunbeam forms through the glittering fibers of dust in the air. Each pinprick of light where a removed nail has left a hole leaks an unnaturally straight beam of sunlight across my room to form small yellow bubbles of light on the far wall, about two inches in diameter. Today, however, it dawned on me exactly what each of those little spots of light really is. It is the sun. Not just sunlight, forming a nondescript blob of light on my wall. 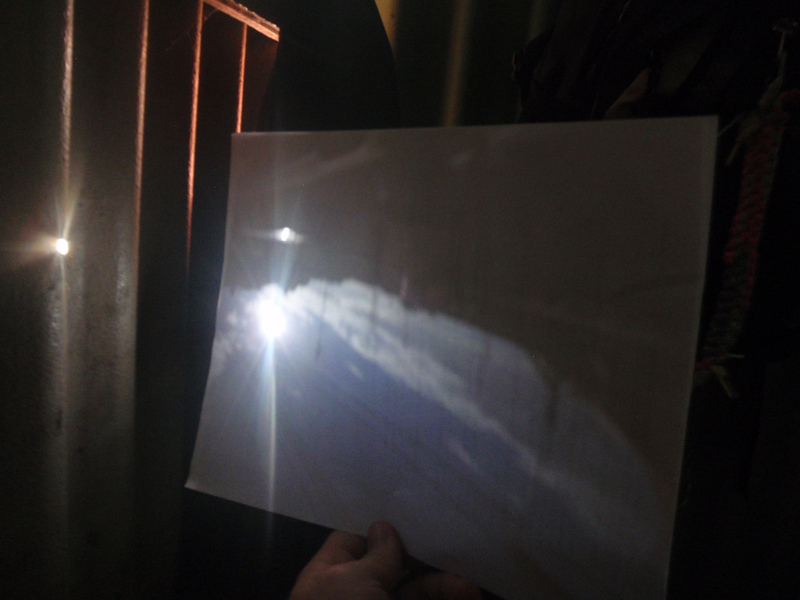 It is an exact image of the sun itself… and, if you look a little bit closer, you discover that the entire scene outside my room is also projected on my wall, not just the sun. You can see clouds, blades of grass, walls, cars, and sometimes even people! 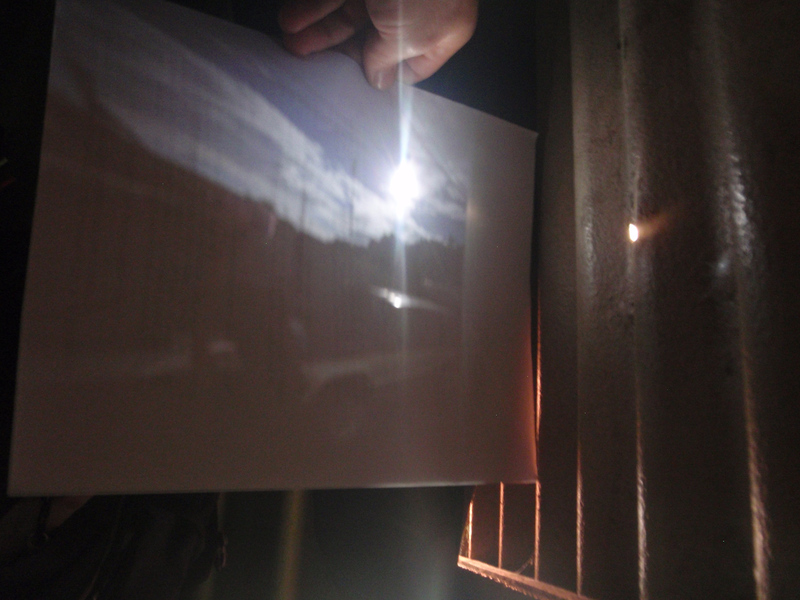 Each spot of light, then, is a sun in the center of a perfect, inverted image of the scene outside my room. I’ll explain. I pieced this together one bit at a time, and when it finally dawned on me what I was seeing, I spent the whole morning giddy with fascination, realizing that I had just discovered that I am seeing before my eyes a “camera obscura,” a dark room with a pinhole that projects an inverted image of the outside world on the opposite wall. After a month of looking curiously at the light spots on my wall each morning, I finally pieced everything together. Part of the fun was discovering that a childhood science experiment and a lifelong hobby (photography) has been plastered on my wall each morning, but I didn’t put all the pieces together until now. 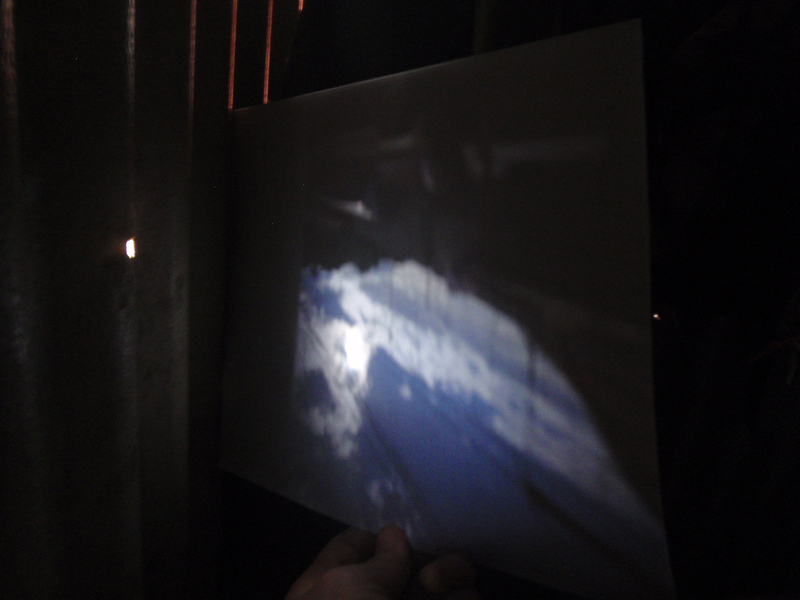 It helps if you understand how a camera works, or better yet, a “camera obscura.” My entire room is a camera obscura, a “dark chamber” upon which the dawning sun is photographed every morning. This is a bit difficult to explain, I realize as I write this, but absolutely fascinating to see unfold before my eyes. A camera works because the shutter opens a small hole of light that chemically burns an inverted replica of the outside world onto the film that walls the back of the camera. Without that “film freeze,” the inverted image is dynamic and moving, like the way our eyeball works. I finally drew all the links together when I suddenly noticed that the small circles of light were changing ghostily, with random patterns creating cloudy patterns over the circles. I looked more closely, and suddenly saw that I was seeing an inverted version of the clouds in the sky pass in front of the sun. In some of the projections, the sun was sliced in half by thin black lines, or the top of it had what looked like a spiky “hairdo.” I realized that what I was seeing was the orb of the sun, blocked by powerlines, trees, or clouds. That “hairdo” was the waving grass blocking the bottom of the sun… in the inverted image it looked like waving hair on top. Each of these pinpricks, then, is projecting the entire scene outside my window onto the walls of my darkened room. Some splay the outside scene across my floor. Because there are ten nailholes letting light through, there are ten projections hitting the wall, all blending together and making it hard to distinguish any specific shapes or images. To single one image out, I picked up a piece of paper and held it about 6 inches from a single nailhole. That’s when the outside scene really came into focus. I could see a perfect, but somewhat blurry, replication of the world outside my room. It was in color – the sky was blue, and the plants looked green! It was detailed… I could see my upside down car parked outside, and the top of Coyol’s taco shack. From time to time I could even catch a person walking by upside down. I hear what sounds like sand being thrown across the sheets of steel. I touch one of the nailholes and realize it is wet. Coyol has woken up and he is tossing water on the outside of my room… I don’t know why, but he’s watering down the side of the house. The images in this post are photographs of a dynamic projection of light. They are taken of the piece of paper I held up to the nailholes of light. The sun and sky are pretty easy to pick out. If you look closely you can see some details – like the tires and frame of my trooper. You can make out some tall grass and shacks on the hill, too. It is sometimes discouraging when I see the places these kids have to play in. Most of the time they play in the street, on rocks and gravel with the stream of gray water trickling by. Someone will fall over a piece of protruding cement, or trip on a spike of rebar jutting out of the ground. The worst thing to gash yourself on, though, are the mangled corners of the sheet metal on the walls, or a protruding nail. There aren’t any real “parks” in La Carpio, nor any “public” places, except the streets, and one cement court walled by a chain link fence over by the garbage dump. On July 25th, the Dia de la Anexión de Guanecaste, I left work about a half-hour early since it is a national holiday for the rest of the country. I was working on editing some photos of my boss’s daughter’s quinceniera. I should mention, or I will probably describe in more detail later, that the entire time I’m living in La Carpio I spend all of my weekdays doing normal office work and attending events, meetings, parties, weddings, and celebrations that contrast quite starkly to the material poverty I return to each evening. It takes quite a toll on me, but I figure if these two worlds coexist so closely, it should be humanly bearable to span between them each day. It’s bearable, unfortunately. 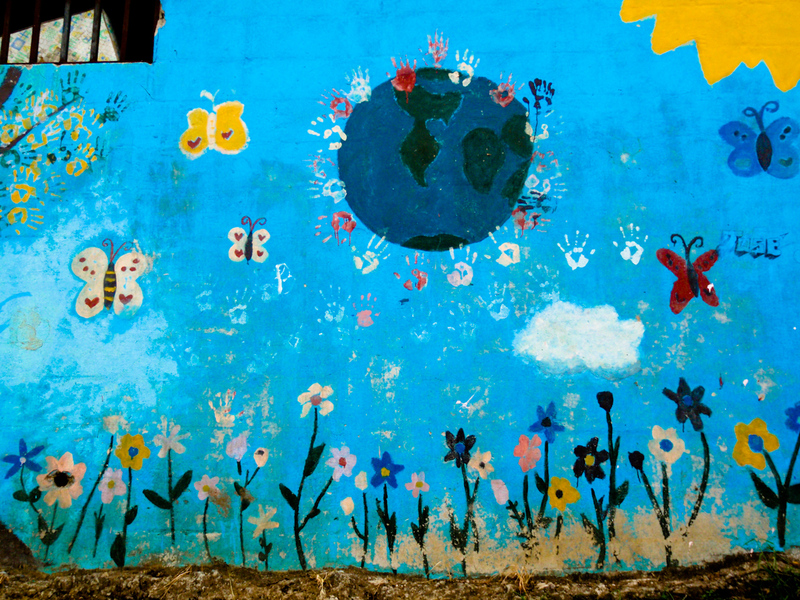 We learn to tolerate it all too easily without too many pangs of conscience. Spending all your time in an affluent context, or all your time in a poorer context, doesn’t often confront you with the gap between the two. We acclimate to our surroundings. What is miserable, discouraging, and heartbreaking is moving between the two extremes. Every. Day. But even to this one can become acclimated. Tonight, I notice that little Britani has a splotch of white plaster-looking paste on her arm. She cut herself on the “zinc”, she explains (pronounced “seen”, the sheets of corrugated metal used to construct the walls and ceilings of our home). A few days earlier, following a conversation about various gruesome cuts and punctures the kids got from nails and the metal sheets, I considered doing an entire investigation of scars and where they’d come from. Alicia peeled part of her scalp off on a corner of zinc when she jumped onto the couch. Carlos had a nail go through his foot, and their cousin Melvin came in limping from the same fate a few days ago. Keyvin caught his calf on a nail and it tore a pretty nasty chunk off, causing a pretty gruesome infection that still hadn’t completely cleared up. Lorna stepped in a fire and her toes healed in a sort of contorted way. She has the most gruesome stories, they tell me. One day, Daniela suddenly explained to me the importance of washing off any food or stickiness from your body before going to bed. The reason is because rats will come nibble it and lick it while you’re asleep. She and her daughter, Britani, show me dark scars on their skin where rats have bitten them at night. I thought I had made peace with the mice squeaking and scratching around under my bed in the morning by ignoring them, but this new insight makes me extremely uneasy. My journal is punctuated with short anecdotes about rats getting into snacks I’d stored, or into my soap, which seemed to be a favorite. I learned early on that I couldn’t store soap or food in my room, but I tried anyways sometimes. They chewed through the plastic containers and through the canvas walls of my duffelbag to get at them. The presence of rats in the house wasn’t really upsetting to anyone; they would occasionally run through the room into the kitchen while we were watching TV. No one exclaimed. They explained that once they could realize their dream of building block walls instead of the metal ones they currently have, that would keep the rats out. Until then, food had to be stored in firmly closed cupboards or hung from the ceiling in bags or containers. This is probably the reason they found me a bed that sits higher off the floor as soon as possible. Had I heard the stories of mice that nibble skin at night or cockroaches that borough in one’s ears and have to be surgically removed, I never would have settled for the pathetic little excuse for a bed that someone with good intentions lent me to use when I first moved in. That low-lying bed is only useful in a house with block walls and tile floors, that rats and creepy-crawlies can’t get in and out of. I had much fewer incidents with the bed the family found me that was higher off the floor. It’s as if my feelings can flip on a dime. Last week La Carpio was on the news as the target for the major operativo that crawled through our streets in the early morning hours. This week, our La Carpio kids are on the news for their awesome progress in the Talento Digital program at the Omar Dengo Foundation. This morning Jags and I went to a big press release they had at the Omar Dengo Foundation. Jags, our three students, and I attended along with mediators from other San Jose neighborhoods. Greyvin was chosen out of all of the students to showcase his project on a huge flat panel screen so everyone could see. He made changes to it as everyone watched, too. Unfortunately, the news cameras had already got their B-roll and walked out. However, Greyvin and his project were front and center. I can’t help but feel a little pride and satisfaction for seeing him there wowing people with his project, for his interest, curiosity, and reckless inquisitiveness into anything relating to computers and programming. It’s very exhilerating to feel like I played some small part in that. The project he created was called “Carrera para plata,” and I felt even more proud when I recognized the plot from an idea he had three years ago,when we first started programming Scratch projects. The game consists of a race where the kid has to win a car race to get money to pay for medicine for his gramma. If he looses the race, Greyvin put a horrible scene of the gramma dying in bed and mom screaming. If he wins, Gramma gets better and everything is good. Very clever. 3D perspective game. Looked awesome on the big screen. Like I said… wow, I can’t get over how far he’s come. And what a feeling of satisfaction and reward it was for me to see him where he’s at. Do other people get days like this in missions work? How often do we see our disciples get outside recognition for what they do? So affirming. And yes, I think he feels it too. He had tons of questions for me about his project last week. Our kids are wanted, but for different things. Greyvin is “wanted” by the technician installing the school network in Finca La Caja school, by neighbors and family wanting computer help, by local ministries assembling new computers for the training centers, by Omar Dengo for his awesome project. Our kids get La Carpio get onto the news, too… but for good things, like Nacho’s mug on the article about digital talent. tonight I wash my hands before going to bed. Daniella and Britani showed me scars where rats had bit them at night. Daniella tells me to wash your hands and any food off your body because when the rat smells it they nibble on it. Dear God that’s not cool. Axel tells me the mona will come after me at 2AM because of the cross necklace I wear. She will take off my head right above the necklace. Conversation with Junior on the bus. He likes living in La Carpio. La Cuarta, where we live, scares him, though. I recall when Massiel and Juri compared La Carpio to other areas on our way to church. They are impressed by the parks. But they like living in La Carpio. They prefer it and don’t want to leave. “Because you can play with cars” (by this they mean jump on the backs of vehicles for a free ride). Because you can shoot off fireworks in the street. You can do what you want. Odd reasons, I feel. However, there is something to the fact that people outside the ghetto don’t experience “true” freedom. They are trapped in certain ways of living and whatnot. They’re very restricted in how they live, through all sorts of formal (and informal) limitations. Don’t know how good or bad that is, but I doubt they realize it and it’s not often talked about. Riding the bus makes life really difficult. It makes carrying stuff risky. One can only carry a few items at a time. It’s very time-consuming. Finding a new place can take several hours. It’s hard to deviate from your route. You can fit less into your schedule and it requires a major detour, and long amounts of time. Getting a ride or driving is SO much easier. My third week has finished up and I’m starting up my fourth here. By Thursday I’ll have completed a month here in La Carpio. In just this short month I already have enough “stories” and crazy adventures to write a book. In the first month pops gets kicked out of the house on father’s day and moves back within a few days, there’s shooting in front of my house related to the major gang conflict, the kids do their mid-term exams for their short break, and the government launches a full-blown operative 7 months in the planning on the delinquents on our block. Most recently I’ve felt really disillusioned about my role here. I don’t feel I’m doing anything useful or helpful. I wish I knew what to do. I wish I knew how to “fix” the social problems I see and the looming pitfalls for the kids in the family approaching the 15-year mark in their lives. I wish I was documenting some profound anthropological insights that would be useful to others in the future. I wish I was making some headway on my practicum. I wish I was recording some of the conversation and fun times we’re having in a lighter sense, like the Amazing Grace book. I wish I was compiling all these things in a journal more in a more orderly manner. I wish I had these things published more regularly on-line. I wasn’t surprised to be present when a full-blown “operative” was executed against our barrio on June 30th. What was surprising was how normal it seemed to everyone around me. 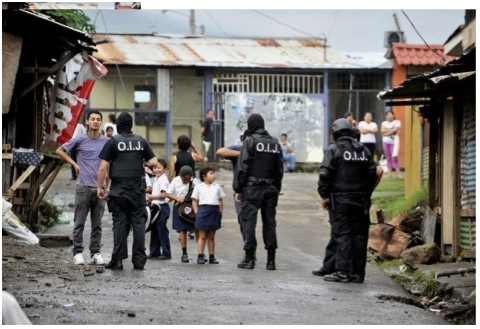 An “operativo” or redada (raid or operative) is when the OIJ (FBI equivalent), law enforcement dressed like SWAT, pour into every nook and cranny of the neighborhood and arrest a list of targeted criminals. The operativo is executed by special forces uniformed in black with helmets, masks, black stockings covering their faces, and toting high-caliber weaponry. The newspapers later reported that 13 minors and 9 adults were detained, and there was no resistance. The raid began at 4.A.M., when I remember waking up to the rushed patter of feet running past on the dirt road outside my bedroom. I went back to sleep not thinking anything of it, because there are always noises of people or animals moving in the street outside my bedroom. When I stumbled out of my bedroom a couple hours later, everyone was at the entrance to the house peering up and down the street. 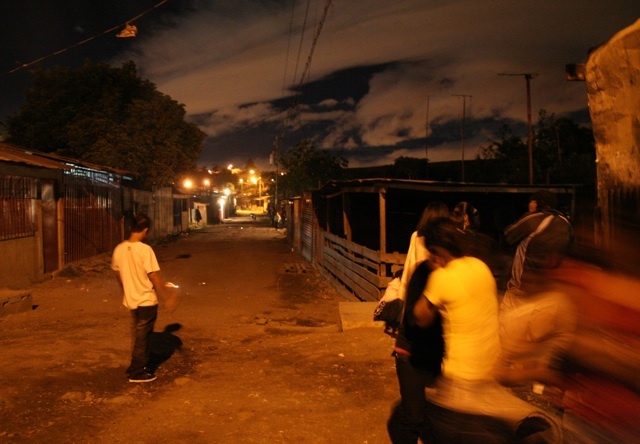 There are a lot of early risers in La Carpio leaving early for work or school, which generates a lot of bustle in the morning hours, even before sunrise. However, this morning there are visitors in uniform and cars with tinted windows rolling slowly up and down the street in front of our house. Four uniformed motorcycle police perched on the corner, with curious kids sitting around them and watching from the curb. My host brother squatted in front of the pulperia (house-store) and played with his yo-yo-top in the dirt around the policemen so he could watch the event unfold. People peered from doorways to witness the spectacle in case anything dramatic happened, but nothing abrupt broke out. Probably the more sensational entries had been conducted early in the morning and we were currently witnessing minor interrogations and searches. I watched for a while and listened to the commentary of the people in the home, recounting how family members had narrowly escaped being questioned or ID’d. At this point, the exits to the main road were blocked by police tape and OIJ officers checking ID’s. Nobody made it through without being ID’d and searched – not people on the way to work, not teachers, not even kids in school uniform with backpacks. The family watched and lightly ridiculed students that ascended the hill to the main road, and then returned because they had no I.D. Estaci, my 10-year-old host sister, tried to make it through later that day but was turned around, and took a long side route through other parts of the barrio to get to class.